ScanBas 365 is a user friendly supervision system (also called bridge system) for fishing boats. These boats and their trawls are equipped with loads of different sensors, which all provide important information to the skipper. ScanBas 365’s mission is to present this information in a both user friendly and extremely moddable way. Since the application is a supervision system, it also warns the skipper as soon as any measurement falls out of the desired zone. For example, a trawl may sink too deep or the trawl opening isn’t as wide as it should be. 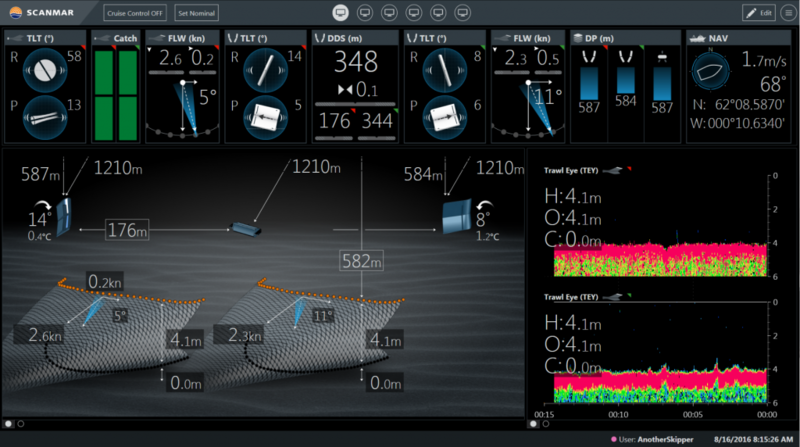 This gives skippers more control and information than ever before, which among other things, helps them to get more intentional catch, and reduce the amount of unintentional catch (also called bycatch). Some of the features include support for up to six screens with any sizes and resolutions, multiple instances running simultaneously, and multiple users. These users may have their own layouts, which are easily created through ScanBas 365’s intuitive drag and drop system. All panels and boxes can be moved around, removed, and resized, which creates a very flexible application. The Spider Graph is one of the flagship features of ScanBas 365. It creates a compact and clear visualization of whatever measurements the skipper wants to keep an eye at. If any measurements moves away from their nominal values, they will start to drift away from the centre of the graph. As soon as any measurement drifts outside its acceptable values the graph will turn red, indicating that the skipper probably needs to take some action. Here is a video showing it off. There are many, many more features that I didn’t bring up here. If you are interested in more information about the application, please contact Scanmar AS or visit ScanBas 365’s product page. Click here for more information about my specific contributions for ScanBas 365.